WASHINGTON (AP) — Israeli Prime Minister Benjamin Netanyahu’s planned trip to Washington in March is kicking up a diplomatic dust storm in the nation’s capital. On Thursday, the White House said President Barack Obama would not meet the prime minister when he comes to the U.S. to address a joint session of Congress. The official White House explanation was that Netanyahu’s visit fell too close to the Israeli election and the Obama administration wanted to avoid the appearance of taking sides. “As a matter of longstanding practice and principle, we do not see heads of state or candidates in close proximity to their elections, so as to avoid the appearance of influencing a democratic election in a foreign country,” National Security Council spokeswoman Bernadette Meehan said. But the timing of Netanyahu’s visit also gave the White House a convenient means of retaliating against the prime minister for his decision to accept an invitation from Republican leaders to address Congress. GOP lawmakers and Netanyahu worked out the arrangement without consulting with the White House or State Department, only alerting the Obama administration a few hours before the Israeli leader’s trip was made public. The White House appeared stunned by what it saw as a breach of diplomatic decorum by Netanyahu, a leader with whom Obama has a history of tension. At the center of the maneuvering around Netanyahu’s visit are the high-stakes, U.S.-led nuclear negotiations with Iran, a nation Israel views as an existential threat. Netanyahu and Republican lawmakers, along with some Democrats, are united in their belief that Congress should pass legislation threatening Iran with new economic sanctions if the talks break down. Obama has vigorously warned that a sanctions bill could upend the negotiations and has vowed to veto any measure that lands on his desk. In another eyebrow-raising bit of foreign intervention, British Prime Minister David Cameron said during his own visit to Washington last week that he had been calling U.S. lawmakers to voice his concern about sanctions legislation. Britain is one of the U.S. negotiating partners in the Iran talks, along with France, Germany, Russia and China. House Speaker John Boehner, who helped orchestrate Netanyahu’s visit along with Senate Majority Leader Mitch McConnell, told a private meeting of GOP lawmakers Wednesday that Congress would proceed on further penalties against Iran despite Obama’s warning. Netanyahu was originally scheduled to address Congress on Feb. 11. But the date was changed to March 3 to coincide with the prime minister’s address to an annual conference held in Washington by AIPAC, the pro-Israel lobby group. 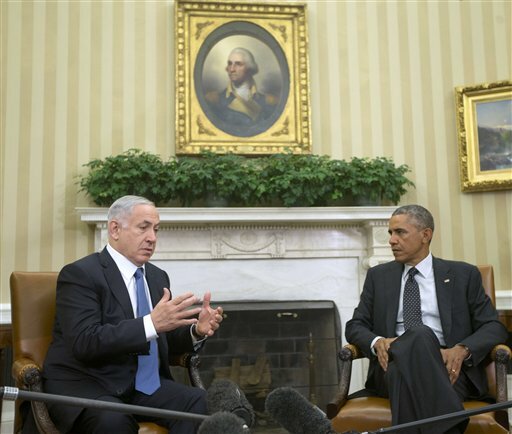 Netanyahu stands to gain politically at home from the U.S. visit. He is in a tough fight to win re-election in Israel’s upcoming March vote. Netanyahu’s Likud Party is running behind the main opposition group headed by Yitzhak Herzog’s Labor Party, which has been highlighting rancor in the country’s critical relationship with the United States. House Minority Leader Nancy Pelosi said it was inappropriate for Boehner to invite Netanyahu to address Congress in the shadow of the election and give the appearance of endorsing the prime minister. “If that’s the purpose of Prime Minister Netanyahu’s visit two weeks before his own election, right in the midst of our negotiations, I just don’t think it’s appropriate and helpful,” Pelosi said. In 1996, then-Israeli Prime Minister Shimon Peres traveled to the U.S. to meet with President Bill Clinton less than a month before Peres faced voters. Peres faced some criticism for using the trip as a ploy to win votes, particularly from opposition leader Benjamin Netanyahu. “I can’t find an example of any previous Israeli government whose prime minister, on the eve of elections, made a cynical attempt to use relations between Israel and the United States as a party advertisement,” Netanyahu said.